Mercedes looks in a mood to revive its old sub brand Maybach with the release of Mercedes-Maybach S-Class 2016. The more spacious model comes in range of models scaling from S500 to S600. 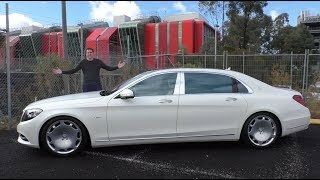 With the release of Maybach S-Class at a starting price of $189,350 and the pictures so revealed we found ourselves inclined towards knowing the model little closely. Here is what we concluded under different headings. With the very entrance in the interior of Mercedes-Maybach S-Class 2016 you’ll start finding reasons behind owning this model. Perforated leather made soft bucket seats will take you into an entire different version of comfort with your head resting upon over-padded headrests. 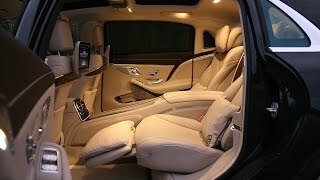 All around the interior of Maybach S-Class 2016 you’ll notice, wood, leather and shining metal giving you loads of space in between to enjoy the comfort. The extended wheelbase shows its true sign at the rear passenger side seat. The arena avails you an option to move the front seat away from you, recline and relax over those comfortable leather seats with options of heating, cooling and massage function. For those looking to do some work, here is a great treat, center console extends out set of tables with enriched looks and made from lightweight alloy. Front passengers are also availed armrest covered in Nappa Leather. While the fiber optic cable spread light throughout the cabin, enlightening work of wood and chrome trim is noticed on dash and doors. In all, the interior is a classic sign of luxury adorned with serenity and comfort. The performance section of Mercedes Maybach S-Class 2016 as of now includes two versions namely, S500 and S600. The S500 model comes with a 4.7 Liters twin-turbocharged V8 engine producing 455 hp and 700 nm torque paired to the all new 9G-Tronic, nine speed automatic transmission. 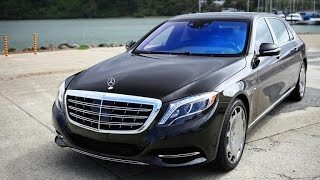 With this nine-speed the Maybach S-Class 2016 S500 becomes the first ever premium sedan to use it. Another version is the S600 mounted with a massive 6.0 Liter V12 engine enthralling 530 hp and 830 nm torque mated to seven speed 7G-Tronic Plus automatic. Talking about on road performance, both these engines reach a top speed of 155 mph while the 0-62 mph sprint gets covered in 5.0 seconds.